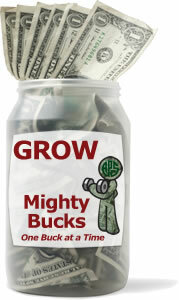 Pat yourself on the back and click to see Mighty Buck's purchases so far. Where $1 a Month Can Make A Difference! The APS would like to introduce you to Mighty "Dollar" Bill. He represents the power of the dollar when hobby supporters join their contributions, strengthening the future of stamp collecting, one buck at a time. What is the Mighty Buck Club? The Mighty Buck Club provides an affordable opportunity to make a BIG difference. We wanted a campaign where we could show our members that donations even in small amounts pooled together can provide much needed funds to improve APS/APRL services and support the hobby. How will the Club support the hobby? supplies to enhance APC visitors’ experiences. See the current list of items Mighty Buck has purchased so far! Becoming a member of the Mighty Buck Club is as easy as buying a stamp online. Just go to the donate link and follow the prompts to make your $12 or more donation.